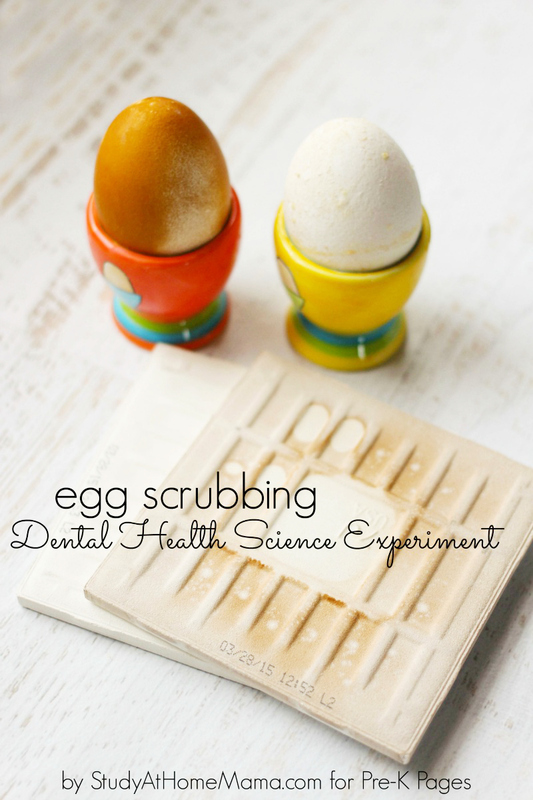 Just in time for Dental Health month, we explored this fun Dental Health Science Teeth Experiment with eggs that emphasized the effects of different drink choices on our teeth and the importance of brushing. 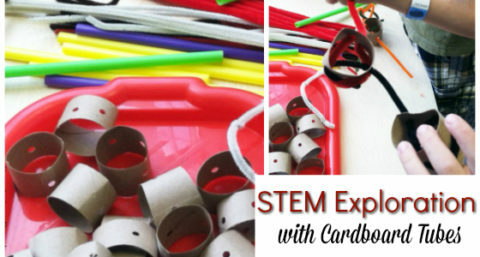 This activity can help preschoolers explore some steps in the scientific method – observation, hypothesis, experimentation, conclusion. 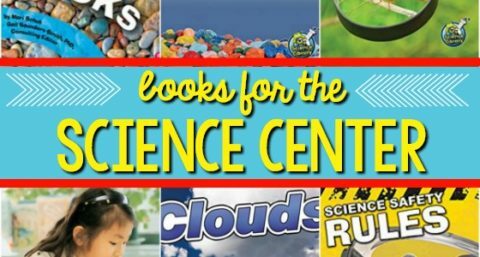 Encouraging children to look closely and think about what they see develops strong thinking skills that can be used in science, social studies, reading, and math exploration. We used the ceramic tiles as an easier option for the younger children in our group. 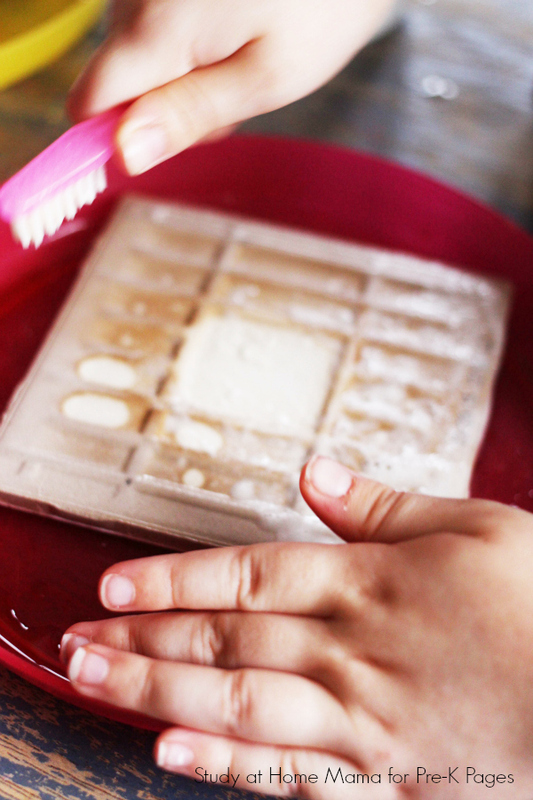 Tiles lay flat and are less likely to move around when brushing, while the eggs have some added side effects from the liquids that are fun for the older kids to observe. 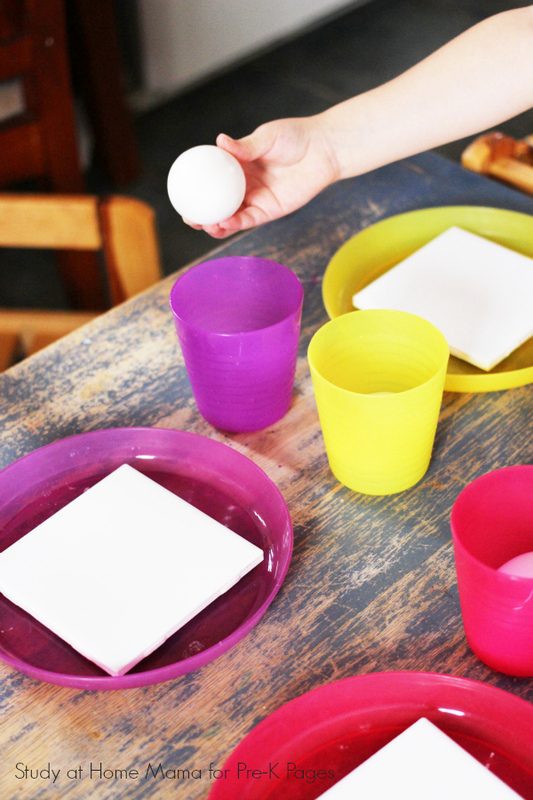 Start by placing your eggs in your plastic cups/jars and placing your tiles in the plates/containers. 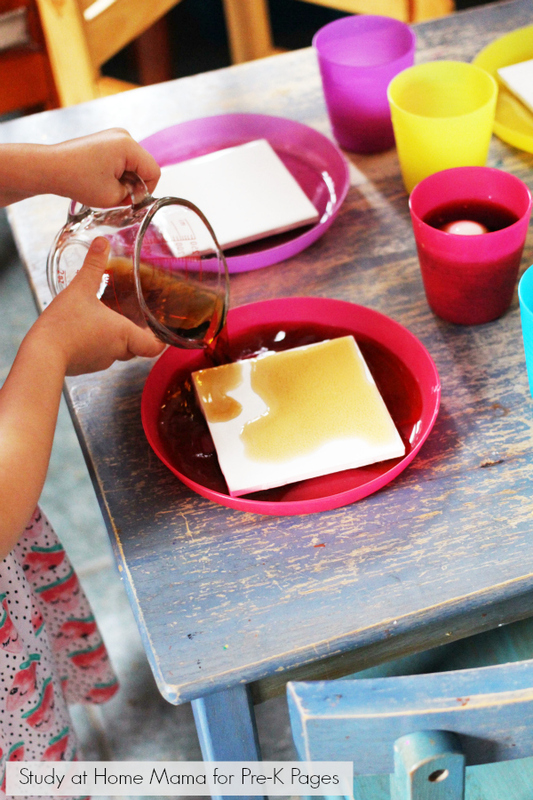 Invite children to pour liquids over the egg and tile until they are completely submerged. We matched our cups to our plates to make remembering which liquid was in which container easier, but if you don’t have colored containers for this activity, try adding a matching sticker. 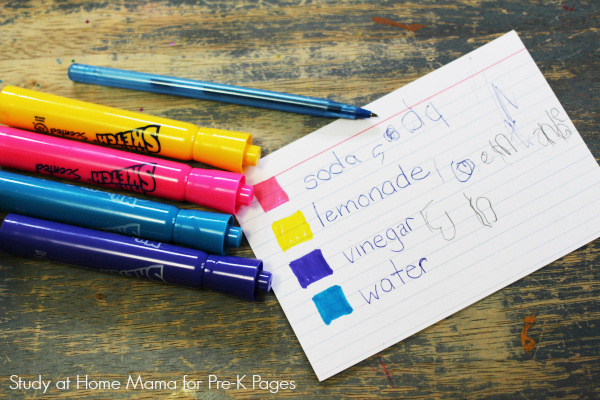 Make an index card or chart to show which liquids are in which containers. Encourage the children to Predict (Hypothesize) what will happen to the eggs when left in the liquids. 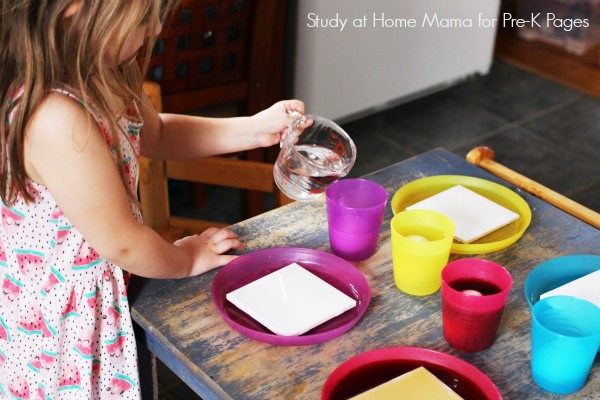 Leave the plastic cups and plates to soak overnight. If you leave them soaking for too long, the egg shells may start dissolving – which is a great experiment in itself but not what we wanted to focus upon. The next day, carefully set up the toothbrushes, water, and toothpaste or baking soda. 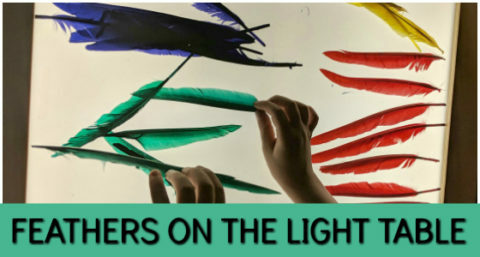 Coming from a Montessori background, I like to emphasize the importance of an orderly work environment for children to really focus on what they are learning, rather than be distracted or frustrated by a messy work environment. 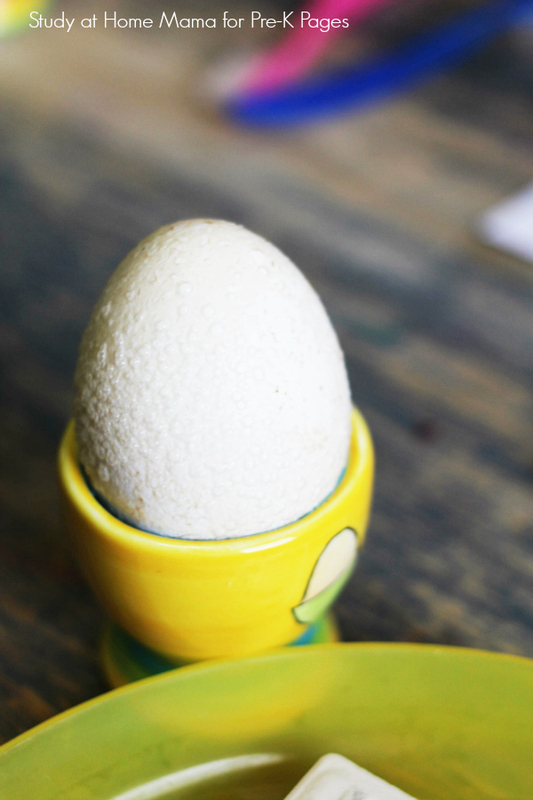 One at a time, remove an egg from the liquid and place it in an egg holder. 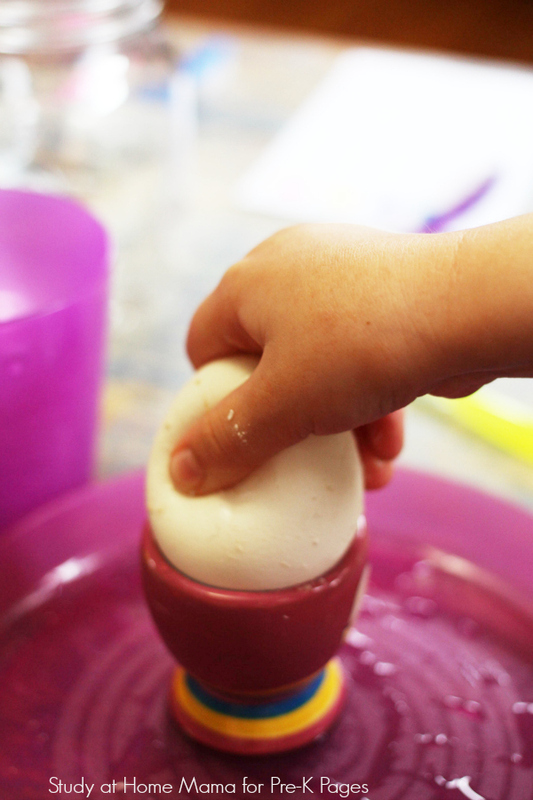 Encourage the children to observe and discuss what the liquids have done to the eggs and the color of the egg shells using their senses. 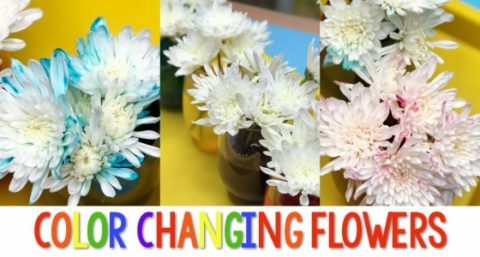 We noticed that the soft drink had the most visible effect on the eggs – completely changing the color of the egg shells! The brown film was hard to scrub off. We tried using water at first and had to add the toothpaste to get it off.This was a great way to show the power of using toothpaste, as a lot of kids dislike the taste or texture of toothpaste when they brush their teeth. The lemonade created a gritty coating on the egg and had almost a bubbly surface. Even though the egg still looked white, when we brushed it we noticed lots of yucky gray stuff coming off on our brush. I encouraged the children to Guess Why (Estimate) why these changes occurred. 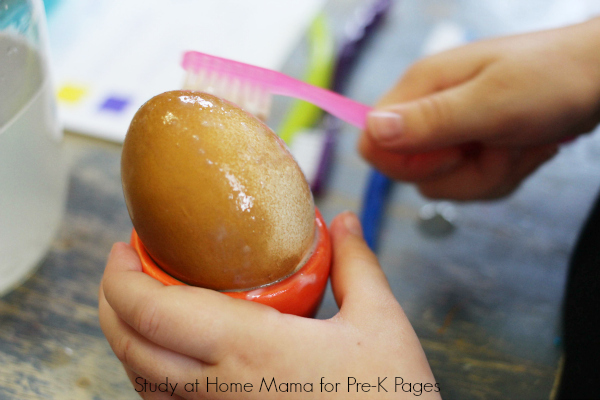 The vinegar egg was probably the coolest of them all – the vinegar had made the shell soft and squishy! We could actually squish the egg and see the impression left by our fingers, without breaking the shell. The water egg was the only egg that didn’t seem to be effected, though it was still a little bit stinky and smelled better after a good brushing. At the end of the experiment, it’s a good idea to ask the children what they remember and what they learned. Encourage them to draw connections between the science experiment and their own lives – for example, asking which drinks are probably better for their teeth, and if you need toothpaste to do a good job of brushing their teeth. You may want to provide paper and pencils or crayons for children to record their observations and conclusions. They can draw or print words to note what they observed. 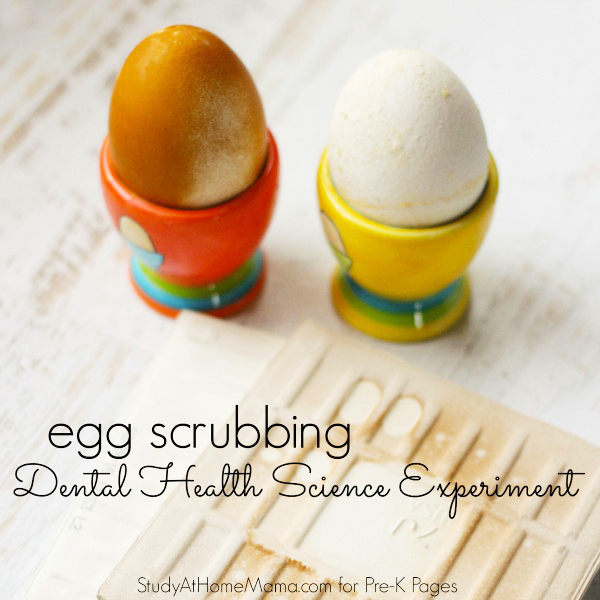 This was a great Dental Health Science Experiment because it was affordable, straightforward, and the kids all understood what we were trying to do – and took the lesson to heart! Some of the children have even discussed the importance of brushing teeth at home and have had an easier time with this part of their daily routine as a result. 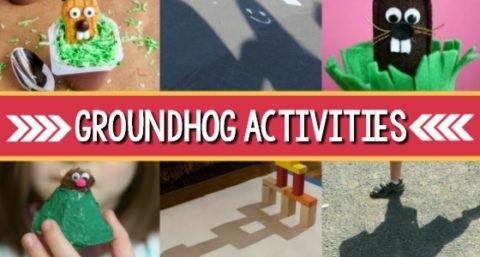 As a follow up to this activity one of these dental health math activities or dental health literacy activities would be perfect for your dental health theme month! 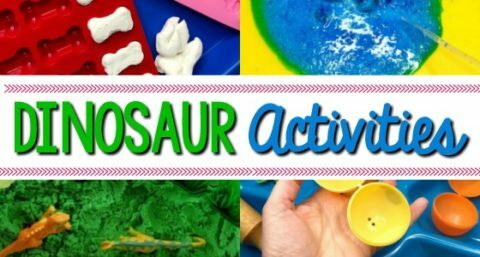 BIO: Jennifer Tammy writes at Study at Home Mama where she shares hands-on learning activities, easy recipes, and parenting inspiration. She is a single mom of one, a trained psychologist, and Montessori-certified preschool owner. You can connect with her on Facebook, Pinterest, or Instagram. 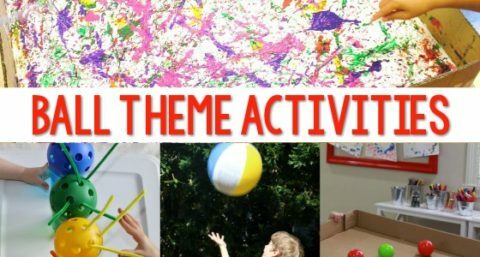 Next Post: Why Use a Sensory Bin in Preschool? Hey Vanessa, Thank you for all the great ideas! I want to do this experiment, but I only have Brown eggs in Nigeria ( Don’t ask why…) Do you think the experiment can work if I peel the eggs? Hi Uzan, thanks for stopping by! No, unfortunately I don’t think it will work without the shells. 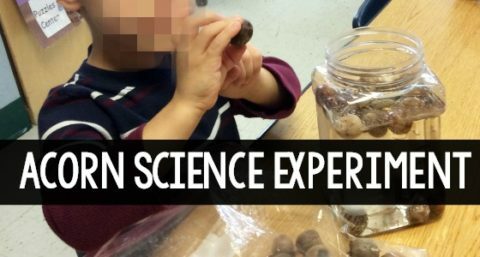 This is a great science experiment for national children’s dental health month. I love the images and it makes for a great learning process. Thank you for sharing with the Thoughtful Spot weekly link-up last week. I am featuring your post on Monday’s new link-up. I look forward to seeing you there :). boil. Thanks for stopping by!